HOW CAN I MAXIMIZE MY HOSPITAL'S PROFITABILITY? HOW CAN I MAXIMIZE MY HOSPITAL’S PROFITABILITY? Much like other businesses, U.S. hospitals have faced economic challenges over the course of the last decade. While recovering from the recession and increases in uninsured care, many hospitals have searched for ways to increase their profitability. Make sure your physicians are efficiently using the OR. Every hospital benefits from efficiency in their operating rooms. But it’s important to remember that even an OR that isn’t busy is still being used as efficiently as possible. Review block times and utilization. The physicians that are assigned more time than they’re using are negatively impacting your profitability. Invest in bone grafting technology. Surgical devices are becoming increasingly popular. Technological advancements in AI and robot-assisted surgery has driven down procedure prices and increased efficiency. But these devices aren’t always massive or complicated. Bone grafting technology such as a graft gun can make bone graft surgery that much more efficient to maximize profitability. Manage your vendors and reduce supply costs. You can reduce your supply costs by working directly with vendors to improve contracts. Don’t shy away from asking your vendor for a discount. You can also reduce costs by lowering the number of vendors you’re using. Aim for approximately four to six vendors. Use data to drive staffing decisions. Labor is a major expense for most businesses, but especially for hospitals. It’s crucial that your hospital isn’t understaffed or overstaffed. Monitor your hospital’s efficiency by reviewing benchmarking data such as hours worked per case. 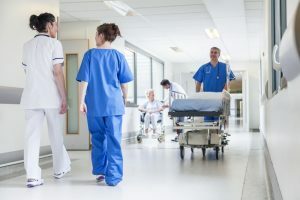 Some facilities monitor their patient volume on a daily basis or even every eight hours and adjust their staffing accordingly. LOOKING FOR DEVICES FOR GRAFT DELIVERY TO MAXIMIZE PROFITABILITY? The world’s largest medical device market is in the United States. In fact, the U.S. medical device market has a value of $140 billion. That said, finding the devices for graft delivery to maximize profitability isn’t as hard as it sounds. SurGenTec offers high-quality graft delivery systems for optimal bone graft delivery and bone repair. To learn more about our universal graft guns for bone graft surgery, contact SurGenTec today.